KEARNEY — Jason Riley keeps his toes in many musical pools. 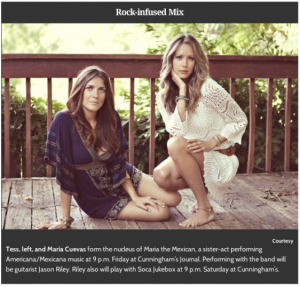 The St. Joseph, Mo.-based guitarist’s latest venture combines the unlikely genres of Americana and Mexicana music, joining forces with two sisters who began performing mariachi music with their grandmother — and now play a rock-infused mix under the name Maria the Mexican. Maria and Tess began performing professionally at age 10. Now in their mid-20s, the Cuevas sisters wanted to try something new.